Mowbray House is situated just north of the historic city of York in North Yorkshire, England. 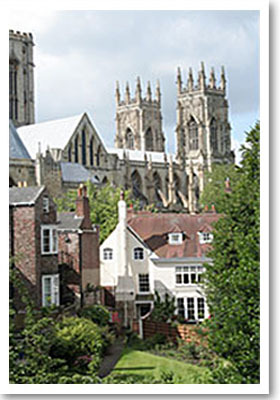 We are only 10 minutes walk from York Minster and the historic walled City centre. We are also within easy access to the ring road. There are hundreds of attractions in and around York including museums, historic houses and gardens, castles and steam railways. The following are just some of the things York and Yorkshire has to offer. The National Railway Museum hosts a fantastic collection of locomotives from around the world. No visit to York is complete without a visit to beautiful York Minster. The Minster is just a few minutes walk from Mowbray House. Another popular attraction in York is the Jorvik Viking Centre, visited every year by thoudsands of visitors from around the world. A marvelous experience! York Museums Trust provides a link to more of York’s wonderful museums including The Castle Museum and Yorkshire Museum. One of Yorkshire’s finest historic houses, Castle Howard (above) is 15 miles from York city centre. The TV adaptation of ‘Brideshead Revisited’ was filmed here. This page has been designed as a resource to show you some of the things to see and do in York. It’s not an exhaustive resource but the links contained within some of the pages you can visit from here will give you a wealth of information. Enjoy exploring!